1930s German Bisque Figurine Scared Child carrying a Pumpkin excellent 3 1/4"
There were a number of different cold-painted bisque items produced in the early 1930s by the Germans with a Halloween theme. These figurines have become quite popular with Halloween collectors over the last ~5 years. I used to see them with some frequency, but that day has passed. I’ll have two such figurines in my annual auction held in May. One has perfect paint - like it was purchased and immediately stored away. If you’ve purchased my reference book from me directly, please ensure that I have your contact information, so that notifications about the auction can be sent in April. The auction is only open to those who have purchased a copy of the third edition of Vintage Halloween Collectibles from me directly. 01/24 Update: This great item sold for $70. I don’t believe this item is from any vintage porcelain tea set - German or Japanese. It looks amateurish, especially the teeth. I think this is the result of someone with a modicum of talent copying the features from an authentic cup, perhaps for their own amusement. It doesn’t have collectible value in terms of vintage Halloween. 02/22 Update: I’m glad no one seemed to be fooled by this fake. It sold for $58.00. 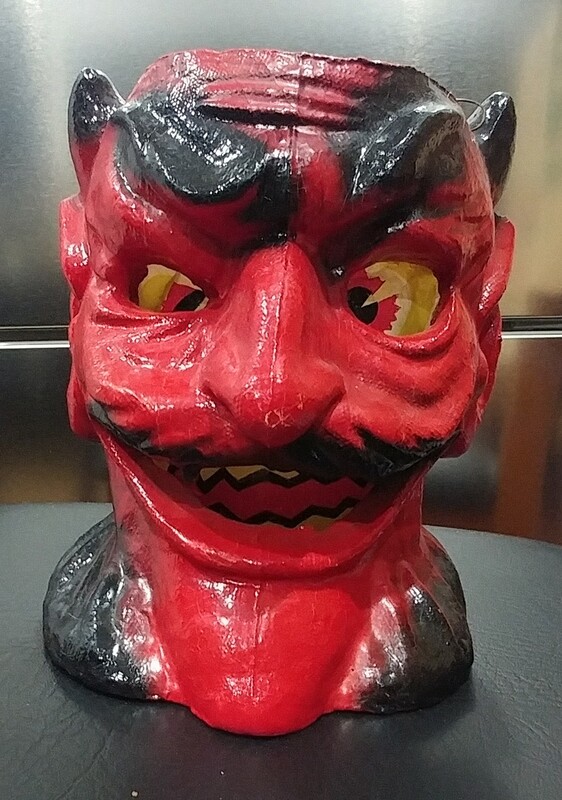 RARE Vintage Halloween Composition Devil Head Lantern W/ Orig Insert Formalite ? I’ve received a number of inquiries as to my opinion of this item. I know the seller to be an ethical and affable person who has long been a collector of vintage Halloween memorabilia. I have much regard for him. That said, I don’t feel this lantern has much age to it. From what I understand, the Formalite process applied to items made from original F.N. Burt molds simply means a gesso-like coating over the typically used pulp, like shown in the second photo. I question why the bottom of the one up for auction is flat. If original molds were used, why wouldn’t the bottom be indented, like the one shown in the third photo? (Notice, too, that the lantern shown in the third photo is marked.) The lantern up for auction seems to be made from composition, not pulp. I suspect it was probably made off-shore sometime in the last 15 years. My thanks to a long-time blog follower for supplying the second and third photos. This large form-factor, elegant invitation was scooped up for a relative bargain. Produced during the 1920s, there is a matching tally card. I purchased a wonderful lot of these small late-1920s diecuts about 18 months ago. I long felt they were probably made by Whitney until I saw an identical image of one of the diecuts on a Hallmark tally card. So, it seems likely this was made by Hallmark. Each of the set of small diecuts has the central image outlined in orange, like this one. That may be a defining characteristic enabling one to attribute any future found such diecuts to Hallmark. I’ll be posting the diecuts now in the collection on the site’s new Acquisitions page at some point. If you haven’t yet perused the Acquisitions page, be my guest. A long-time collecting friend of mine scooped up this exceedingly rare Beistle treasure for the laughably low price of $136.16. (The clueless seller had listed it in the Halloween Modern category causing people like me, who seldom troll those dispiriting listings, to miss this treasure. I’ll be adding a daily perusal of this category from now on.) The lantern this uninspired Beistle creation - a puzzle for simpletons - depicts, was produced in 1930-1931, so the enveloped set was surely one of the last items they produced with the diamond mark. So, at this point, I know now that Beistle used the stunning art of the lantern, which was made in two sizes, only on one other item - this puzzle. Although these items do not fall within the category of a vintage Halloween collectible, I thought I’d comment on this sale nonetheless. I began seeking to buy complete Antikamnia Chemical Company calendar sets over twenty years ago, well before interest in them began to soar. The firm, long defunct, sent calendars to doctors gratis as an advertising gimmick. The first calendar was 1897. From that year through 1900 each complete calendar consisted of 6 hand-tinted cards showing two months each. These mischievous skeletons were drawn by Louis Crusius. Although he died at a young age in 1898, Antikamnia had purchased enough drawings to publish and distribute these calendars through 1901. (The last year’s calendar consists of only 4 hand-tinted cards showing three months each.) I now own near-mint or better examples of each calendar page, numbering 28 in total. They look awesome framed together. I’m glad to see they are finally getting the exposure in popular culture that I feel they deserve. I feel $1200 is an enormous sum to pay for this trio of favor baskets. Beistle produced four designs of this size from 1927 through 1931. The best design, the witch wearing a dress decorated with skulls, is not amongst this trio. Even at $300 each, the envelope isn’t worth the remaining $300. It might be if it was something to look at, but being a plain glassine envelope limits its appeal and brings the “wow” factor down to nothing. This seller has listed this very common pulp nut cup at the laughably high price of $975! Shipping is only $10.80. How rose-colored are their glasses? It must be great to be so optimistic! 01/10 Update: Some sense in making its way into the seller’s head as the BIN price has now dropped to $800 OBO. Fair market value is $35. This is an interesting item. The art was almost certainly derived from Dennison’s Gobolink cut-out, which they released in 1925. Although Dennison provided some financial assistance in capitalizing the C.A. Reed Corporation during the 1920s, this item is the first tangible result of the arm’s length relationship between the two firms I’ve seen. There are subtle differences, most notably the extra buttons to better hold in this version’s slightly more-swelled belly! Here is another relative bargain, although not as pronounced as the item directly below. This has to be one of Dennison's most inspired designs. The artist packed a lot of detail in such a small item, meant to be used as a place card. This first appeared in 1928. As I point out on page 257, "Notice the cat's face in the flame and the candle's expression. Although not particularly scarce, this iconic, diminutive Dennison masterpiece consistently sells at or above the cited value. It was sold with stock number H565." These have routinely changed hands in a range of $135-200 during the last 18 months, so the prevailing bidder did well. Wow, people were asleep at the switch here, including me. This is one of those increasingly rare, true bargains for a great piece of truly vintage Halloween memorabilia. This is one of four favor basket designs Beistle produced from 1927-1931. (I think it is the least interesting of the four designs. The best is the witch wearing a skull-festooned dress.) You can see them all on page 225. This exceedingly rare double vase certainly went for a lot of money, mainly due to my bidding. I was the underbidder, actually content not to have had to pay my top bid of $3215.15. I placed the bid, thinking there may be a very few collectors more crazed than I who would pay such money. I was right. 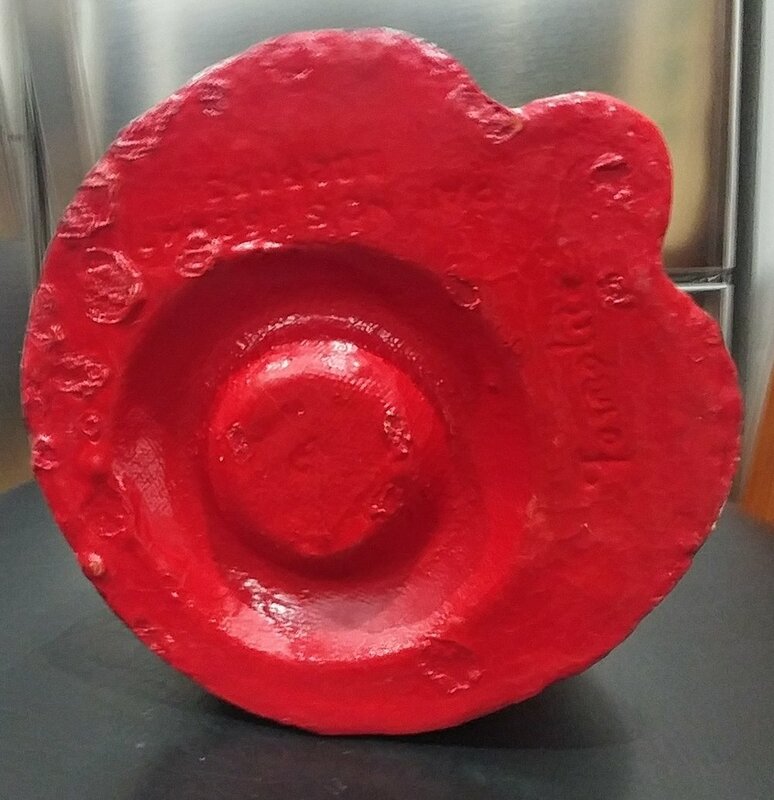 Although I would liked to have it as part of the collection, in the final analysis, the price was too high, so I was not unhappy to have been outbid. Congrats to whomever the prevailing bidder was.